Jogging pants are essentially lined pants, but the lining doesn't have to be hemmed separately, as in dress slacks. It is best to baste the lining to the outer fabric and treat this "sandwich" as one piece of fabric. After basting, mark the new hem. Turn pants inside out and press the new hem up on the line you just marked. Unfold this new hem allowance and mark 1½" down from that fold line. Cut here. Fold up 3/4", press, then double this and you will be folding along the first crease that you made marking the new hemline. You now have a hem that is double thick and encases the lining. I usually turn the pants right side out at this point and top stitch the hem. Go around again and stitch a scant ¼" down from your first stitching, or use a double needle to give the pants a professional look. Today's lesson: Pay attention to what you're doing! I have a stack of alterations today, many of which are black slacks. I've read the tags attached by the dry cleaner, so I can estimate my sewing time. I also group my hand sewing tasks so that I can put a TV show in the DVD player and kind of watch while I work. Although I know it slows me down a bit, I use the DVD player as motivation to get to my sewing room. It's not as big of a distraction as a sink full of dirty dishes or my email or Facebook accounts. Or so I thought, until I removed a perfectly good zipper from the pants that need a repair near the pocket area. Now, I not only have to put that zipper back in, I have to start the whole zipper process over again with the right pair of pants. . Carelessness will cost you money! Finally, after such a long while, I have added a page to my website, LearningAlterations . Please click on the link and let me know what you think. I'd love to have your feedback. Do the directions make sense to you? Let me know by leaving a comment below, or write me privately on the Contact Me page. Also, I am in the process of assembling lots of pages. I don't have them in any particular order. If you have something you want me to write about next, tell me. I'd like this website to help with what you may be working now, or would like to be working on soon. Leave a comment below and I'll get right to work! Do you know a man who is keeping to his New Year's resolution to lose weight? If his pants are beginning to get too big in the waist you can easily alter them. Most men's dress slacks have a center back seam that can be taken in quickly and leave no signs that it has been altered. The following directions also apply to letting pants out. 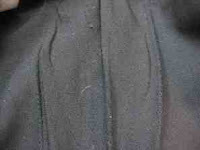 Just make your line of stitching to the right of the existing seam instead of the left. First remove the belt loop. Next, detach the back waistband from the inside of the pants. Below is a before and after picture. Next calculate how much you want to take in. Divide this in half and mark your new seam line either using chalk, pins or water-soluble marker. 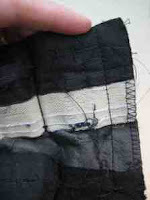 For example, if you want to take the pants in 2", mark a stitching line 1" to the left of the existing stitch line. Then stitch where you have marked. Below is an example. I am taking in quite a bit. 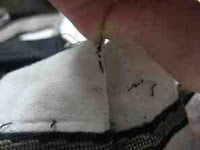 After that you have to remove the original seam's stitches. Be careful not to nick the fabric here and be sure to pick out all the little leftover threads. Cut and serge the excess seam allowance if necessary. 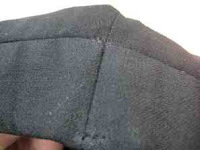 Press the pants flat to remove the stitching line. Finally, you want to fold the waistband back down into place. 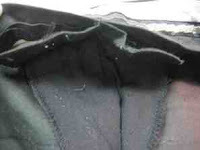 Then with the right side of the pants facing up, run a line of stitching in the ditch created by the waist/pants seam. You can fudge it a little, as I did here, because the belt loop will be over top of it. Replace the belt loop and you are finished!